The first stop is to be at Palembie, a village famous for its unusual spirit house. We are told it is one of the few villages not actually by the river and it will be a 20 minute walk from the river bank. But as we pull in to moor we are met by a villager who tells us that the land is flooded and inaccessible by foot. He suggests we try and use a tributary to get there. But the tributary turns out to be little more than a tiny stream. 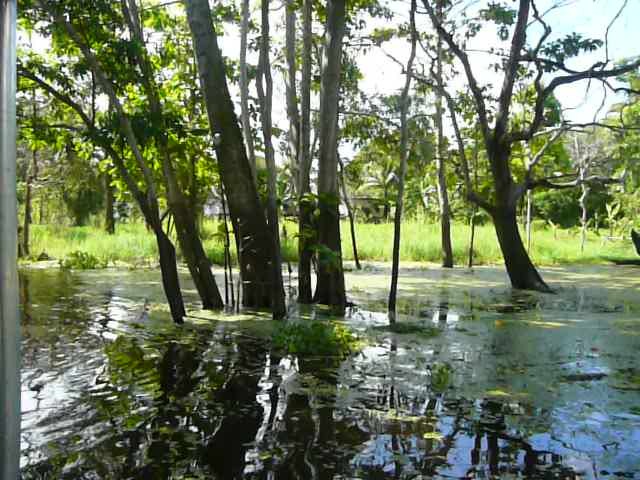 We slowly inch our way up it but after a while it just becomes part of the flooded land and it is impossible to tell which way to go. 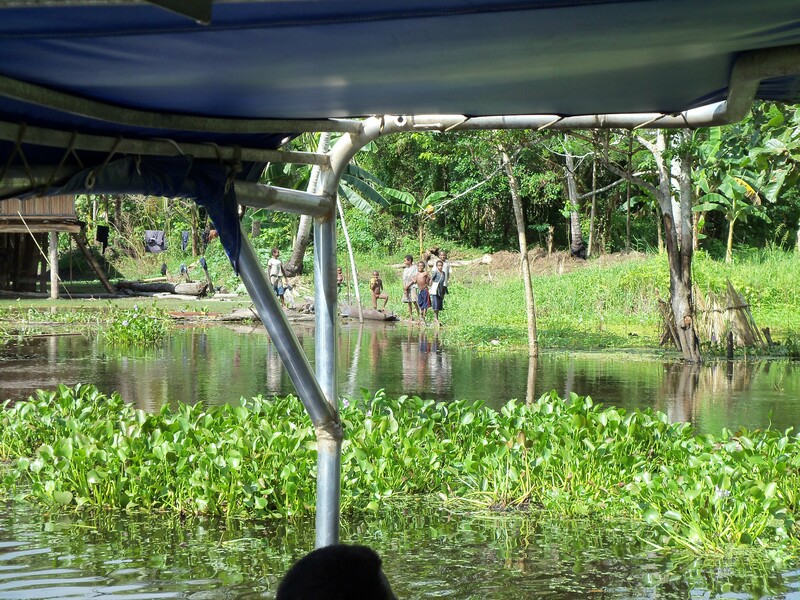 The water is full of water hyacinth and fallen tree branches which means we have to cut the engine. As we sit in the middle of the floods a rather impressive looking man appears from nowhere, jumps into the water and starts pushing the boat through the water, clearing a path as we go. Meanwhile we can hear the village drums beating out a message to tell the villagers that we are on our way. 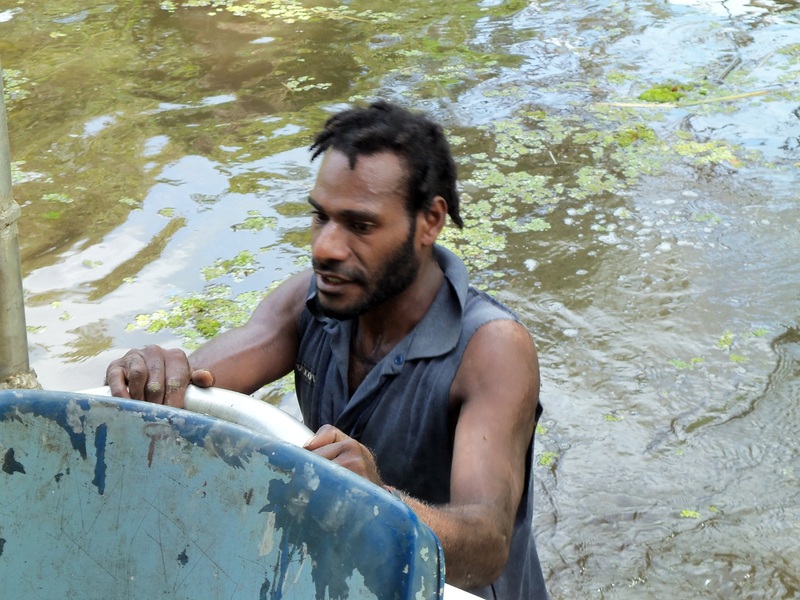 Before long we have more villagers helping us with the boat. 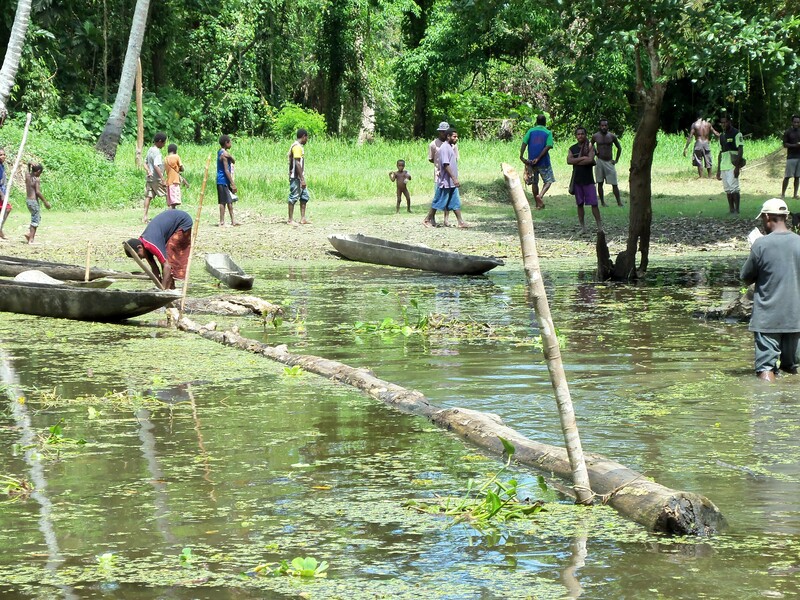 Crossing the logs is precarious, but we dare not complain after what the villagers have done to get us to their village. 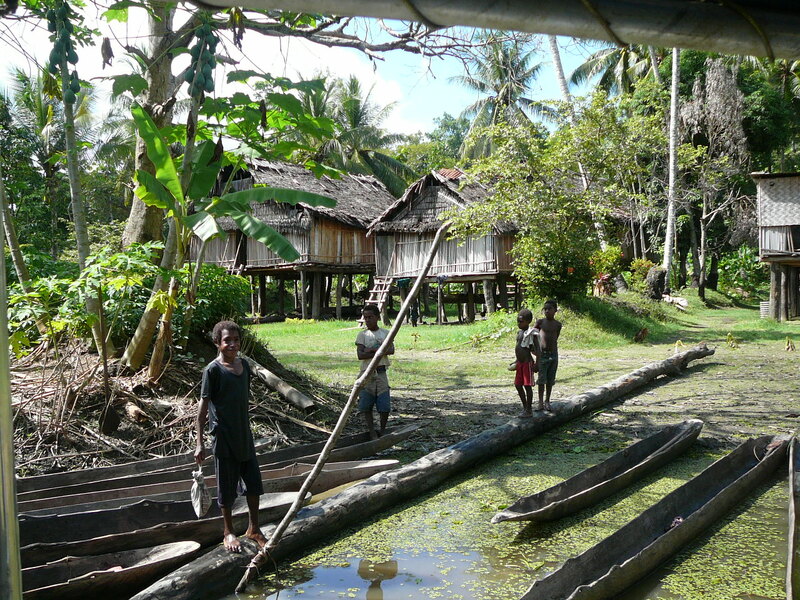 We try not to fall in as we have an audience of villagers seemingly waiting for one of us to do just that. Once safely on dry land we make our way into the village. Our first stop is at the Mens House. As a gay man I am delighted to hear that every village has a Mens House, and make a note to visit as many as possible. 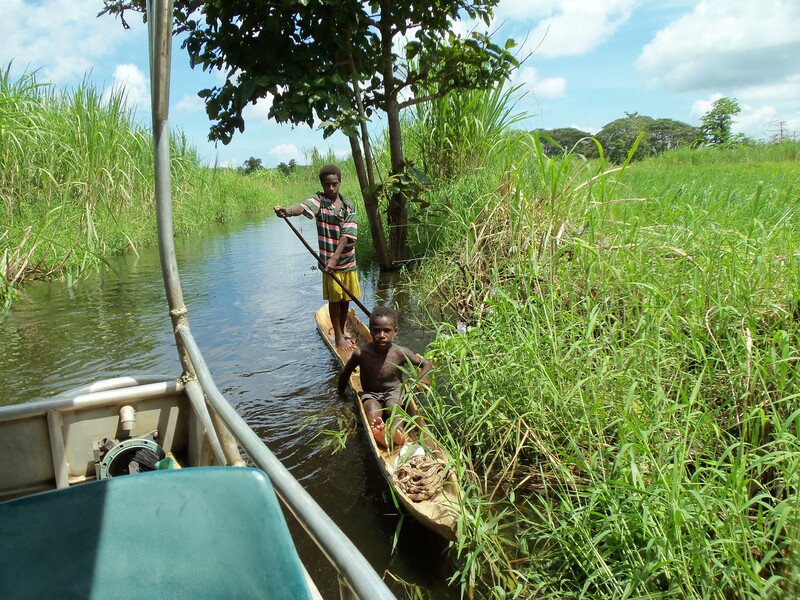 When in PNG …………! This is where the men meet to discuss the matters of the village, or when there are no pressing matters to discuss, they can just hang out. It’s like a pool hall without the pool tables, or a sports bar without the bar, and without the TV. But the atmosphere is the same. After all, in a small village in the middle of the jungle how many pressing matters can there be to discuss. It’s also the perfect place to escape from the women who are not allowed into the Mens House. Perfect! The women, of course do not have a similar house. They are second class citizens once again, and besides that they are too busy to have the time to hang out. The mens house is where the drumming is coming from. Some of the men invite us inside to listen to the drums. The drums are wonderful pieces of art. They are made from huge hollowed out tree trunks with a narrow opening on top. 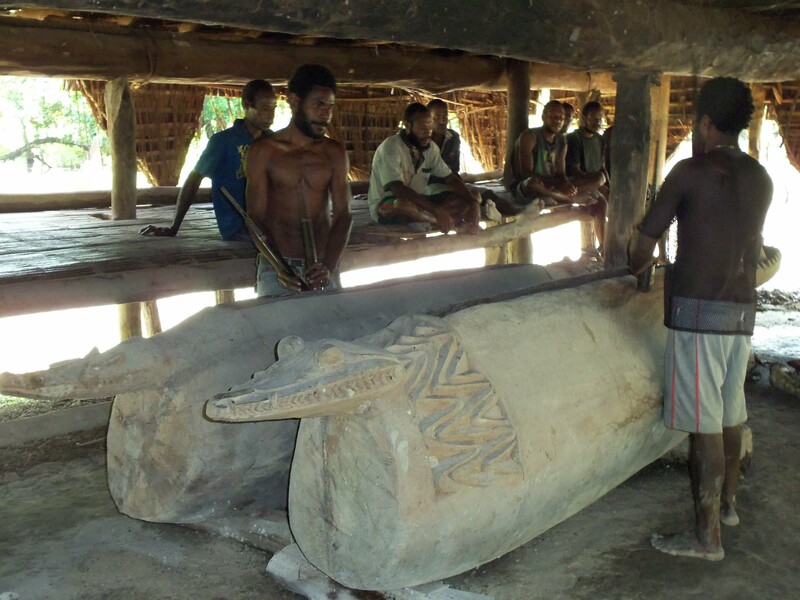 At either end there is a carved decoration, often of a crocodile head. The drum sticks are several feet long with ornate carvings at one end. They are struck against the outside of the drum or to make a different sound they can be inserted into the opening and banged against the inside. There are three different drums inside the spirit house and several drummers give us an impressive demonstration of the music they can create, each drummer matching the pulsating rythm, beating their drums in perfect unison. Eat your heart out Ringo Starr and Keith Moon. There is even one drummer with enough ‘tude to get him into any rock band. From the Mens House there is a long path across an open area of grass leading to the Spirit House. The path is lined with village women selling their handicrafts. They make household items such as jewellery, bilum bags or baskets. It is such a different feeling from the Huli villages. The Hulis have yet to realise that tourists want to shop. They produced little to sell. They might hang a few pieces of jewelry from a tree branch for us to look at, but made no effort to show it to us, let alone sell it. 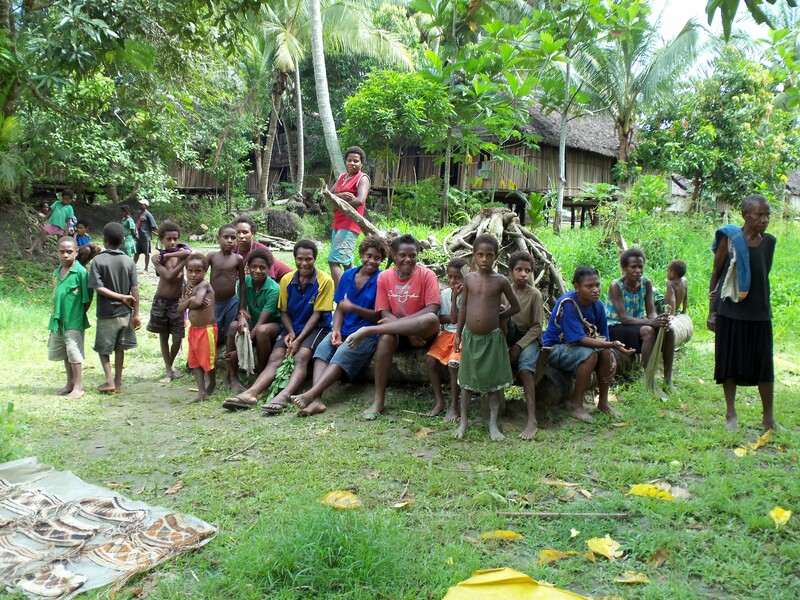 But on the shores of the Sepik, the villagers are learning that the items they make for everyday use in the village are desirable to the tourists. They are becoming merchants. Once again though, the separation of the sexes plays an important role in the art that is sold. 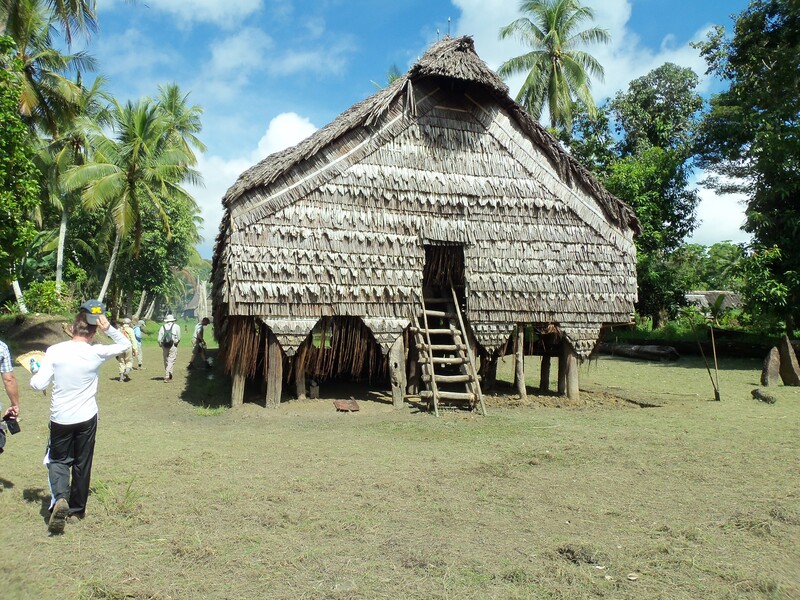 It began when the explorers first came to the Sepik and were awed by the amazing art that they saw in the Spirit Houses. Dealers soon followed, but the tribes would not sell anything from the Spirit Houses. The tribes people had no concept of selling art, they made their carvings for spiritual reasons. But the almighty dollar had its usual effect, and soon the villages were creating art for the merchants. But the carvings and art in the Spirit Houses can only be made by men. Now when tourists come to a village, the villagers spring into action. 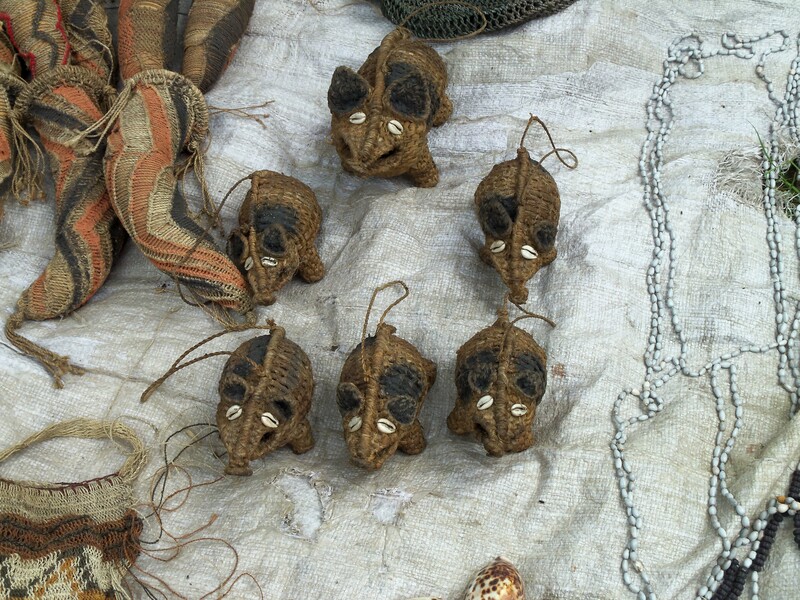 Even though it is rarely more than a handful of tourists the entire village rushes to get whatever carvings and woven items they have for sale. Shopping, however, holds little interest, when there is something far more gruesome to be seen. The people of Palembie were headhunters, a small detail the guide forgot to mention until this point. 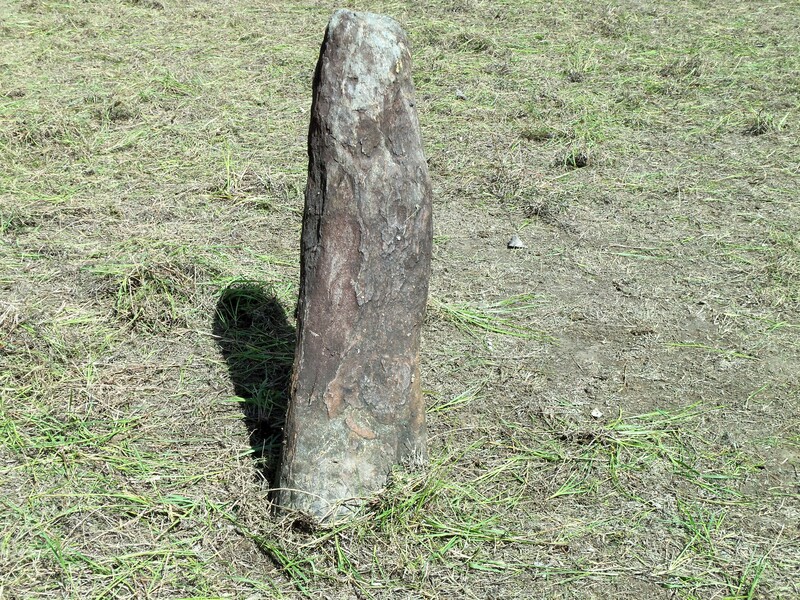 In the middle of the field is a blood stone, a large tall rock on which the heads used to be displayed . We are told all this in the past tense, but the rock is still stained with blood. I am not a forensic scientist and so can’t tell how old the stains are. I am too nervous to ask, but the juxtaposition of the blood stone and the items for sale has me worried. Is there a rather severe penalty for not buying anything? 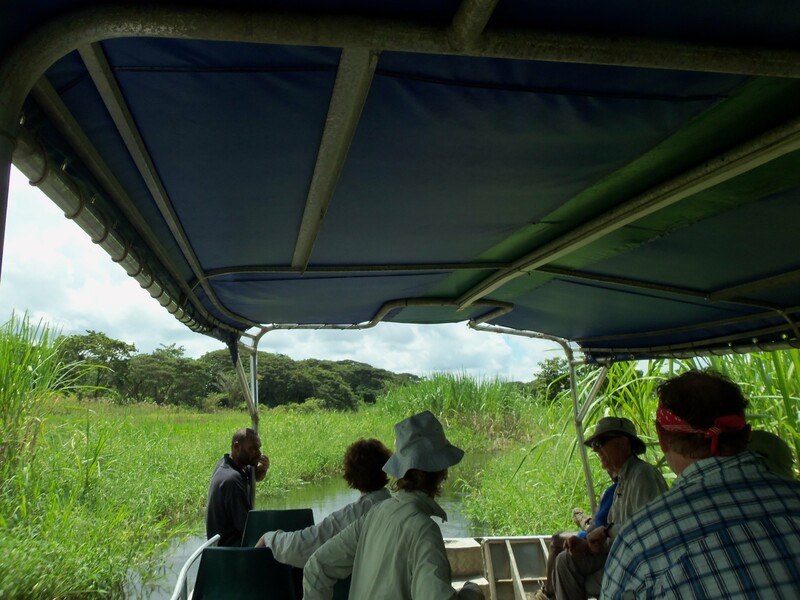 Our guide talks with great disgust of these headhunters. But we subsequently learn that the guide and his tribe were cannibals. So that explains the long lascivious looks he has been giving me all morning. There is a certain irony to the righteous indignation of the guide. Is headhunting so much worse than cannibalism. And not to be outdone, the headhunters find cannibalism disgusting. Who are they to judge! The lower floor is open sided, and has benches several feet off the floor where the men relax. We are beginning to notice a theme here of how every building is set up for the men to relax in. In the centre of the floor is a string of fires that are kept alight all the time. Strangely enough the upstairs of this Spirit House is little more than a shop – and a most impressive shop at that. It is filled with a fascinating display of carvings, face masks, drums and so much more. And it is all for sale. Not the usual use of a Spirit House. Could it be that the men are using this space to sell their artwork so that the women can’t see how much money they are making? Or are the missionaries encouraging other uses for the Spirit Houses? And if so, perhaps they are conveniently forgetting about the money changers in the Temple! We have to leave the village the same way we came, so once again the four men jump into the water and push us back to the tiny stream. It can’t be pleasant for them, but they do it with amazing good humour, making jokes and laughing the entire way. When we can turn our motor on again three of the men wave good bye, but the original helper climbs on board and volunteers to come with us to the river to make sure we make it. Once there we drop him off on the river bank. He waves goodbye before starting the long journey back to his village. 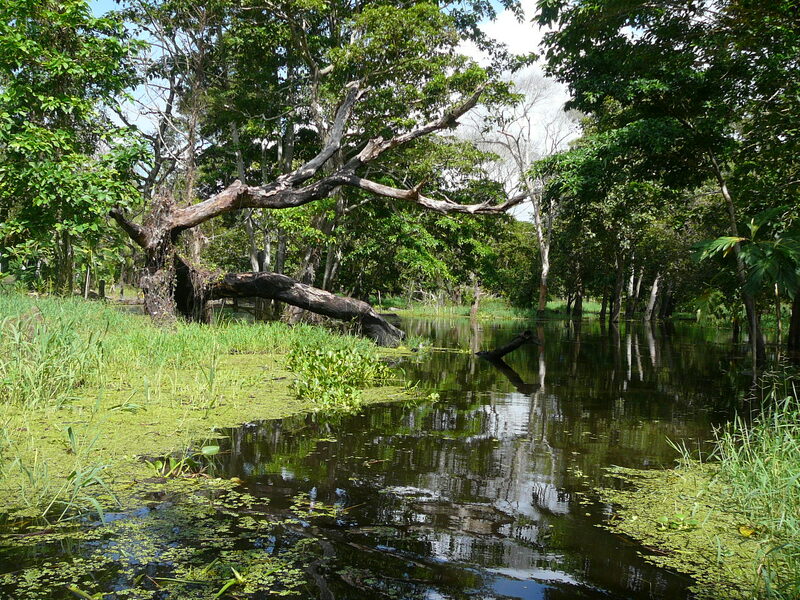 This entry was posted in Blog, Papua New Guinea, Sepik River and tagged palembie, sepik. Bookmark the permalink. Who is the bird warbling on the You Tube clip? Pure gorgonzola.